I stand here before you ? a young man in the presence of great wisdom, experience and achievement - in an institution of such eminence and consequence in world history. There is little that I can say to be of much use to you. On the contrary, it is I who shall take away so much from this historic moment. For this I am grateful. Jetsun, my wife, and I also thank you for the kind invitation to Japan only one month after our wedding, and for the warmth with which we have been received. This is an extraordinary gesture that reflects the generous spirit with which you support the long friendship between our two countries. Your Excellencies, before I go any further ? I must convey to you the prayers and good wishes of His Majesty Jigme Singye Wangchuck, the Government and people of Bhutan. The Bhutanese people have always held a strong affection for Japan and shared emotionally in the success of your great nation over the decades. the news of the tsunami unfold ? sitting helpless and unable to do anything. I have waited ever since to be able to say to you ? that I am deeply sorry for the pain and suffering of families who lost loved ones ? for those who lost their livelihoods ? for the young whose lives have been completely altered ? for the nation of Japan that must rebuild life after such great disaster. No nation or people should ever have to experience such suffering. And yet if there is one nation who can rise stronger and greater from such adversity ? it is Japan and her People. Of this I am confident. On your path to rebuilding and restoring of lives, we the Bhutanese people stand with you ? humble in our power to provide material assistance but heartfelt and true, in our friendship, solidarity and goodwill. Your Excellencies, we, in Bhutan, have always thought of the Japanese people as our fellow brothers and sisters. Our two Peoples are united by our commitment to - family, integrity and honour; to placing the aspirations of the community and country before one’s own desires ? to raising the common good above the self. 2011 is a special year in our relations ? it marks the 25th anniversary of our diplomatic ties. Yet, the Bhutanese people have always had a special affection for Japan that goes beyond our formal ties. I know that my father and his generation watched with pride as Japan led Asia into the modern world decades ago ? as you brought confidence and a sense of an Asian destiny to what was then a developing region ? and as you inspired so many countries who have since followed Japan into the forefront of the world economy. Japan was and continues to be a leader. Even more so today ? because in this globalized world Japan is an example of strength in technology and innovation, of hard work and commitment and of strong age-old values. The world always identified Japan as a people of great honour, pride and discipline ? a people with a proud tradition in history ? who approach everything with tenacity, determination and a desire to excel ? a people of unity in thought and action; of brotherhood and fraternity and unfailing strength and fortitude. I must humbly state, that this is not a myth ? this is a reality that was displayed in your response to the unfortunate economic recession of past years and to the natural disaster in March. You displayed the true qualities of Japan and her people. What would have shattered other nations and caused anarchy, chaos and lament - was met by the Japanese people with quiet dignity, confidence, discipline and strength of heart, even under the worst of circumstances. In our present world, this combination of excellence ? with strong roots of culture, tradition and values ? is almost impossible to find. Every nation aspires to it - yet it is an integral aspect of Japanese character. These values and qualities were not born yesterday ? but were born from centuries of history. They will not disappear in a few years or decades. What a great future lies ahead for a Japan that possesses such strength. For this strength has seen Japan rise again and again, throughout history, from every setback to its status as one of the most successful nations in the world. And even more remarkable is the manner in which Japan has always, without hesitation, shared her success with people in all corners of the world. Your Excellencies, I speak from the heart, and on behalf of all Bhutanese. I am no expert or academic ? just a simple man with a deep affection for Japan. All I am saying is that this world will benefit immensely from a Japan that defines excellence and innovation; from a Japanese people of great determination and achievement yet quiet dignity and humility; from a nation that other countries can look to as an example. And as Japan leads Asia and the world ? as Japan’s presence in world affairs reflects the great achievements and history of the Japanese people, Bhutan will cheer and support you. Bhutan not only believes in the need to expand the United Nations Security Council, we are convinced that Japan must play a leading role in it. You have our full commitment and support. Bhutan is but a small Himalayan nation of about 700,000 people. The country's enchanting physical characteristics coupled with a richly compelling history defines every fiber of the Bhutanese character. It is a beautiful country and in spite of its geographical size across the length and breadth of its varied topography lie scattered, numerous temples, monasteries and forts, reflecting the spirituality of generations of Bhutanese. Our environment remains pristine and our culture and traditions, strong and vibrant. Bhutanese continue to live lives of simplicity and modesty that foster a deep sense of harmony among our people, as we have done so for centuries. Today, in this fast changing world, I'm most proud of the manner in which we live in a caring society where our people value harmony above all - where our youth have exceptional talent, courage and grace and are guided by the values of their forefathers. Our nation is in the able hands of our young Bhutanese. We are a youthful, modern nation with age-old values. A small beautiful country ? but a strong nation too. Thus, Japan’s role in the growth and development of Bhutan is therefore very special. You have not only provided valuable aid and assistance but also been the source of strength and encouragement as we strive to fulfill our unique aspirations. Your generosity of spirit and the higher, greater natural bond between our two peoples that is un-definable and yet so deep and spiritual - ensures that Japan will always have a friend in Bhutan. Japan has been one of the most important development partners for Bhutan. Therefore, I am very happy to be able to thank the government and the people of Japan who personally lived in Bhutan and worked with us, for your steadfast support and goodwill for our Bhutanese people. I hereby pledge that it shall be my constant endeavor to further strengthen and deepen the bonds between our two people. Once again I convey the prayers and good wishes of the People of Bhutan to the People of Japan. 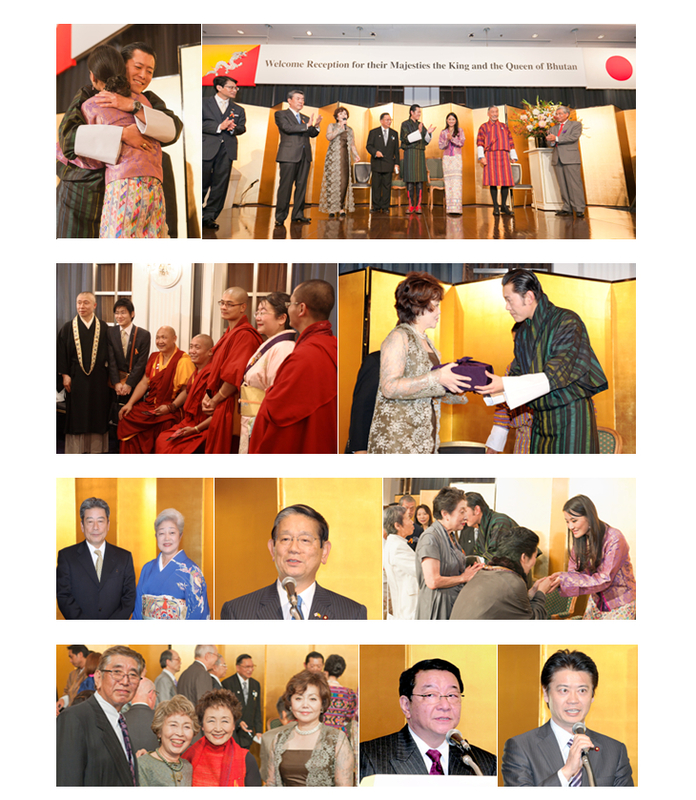 Welcome Reception co-sponsored by the Japan-Kingdom of Bhutan Parliamentarians’ Friendship League, Honorary Consul-General of Kingdom of Bhutan in Tokyo and Japan-Bhutan Friendship Association was held on November 17, 2011 at the Hotel in Tokyo. In the speech by HM the King, he said “I want to hug everybody here, however, it is impossible. I will hug my wife”, and he hugged HM Queen. The reception place was wrapped in applause and smile. Over 450 attendees were attracted by Their Majesties, and at the end of party, quite many attendees made a long line to shake hands with this good faith and dignified young, beautiful couple. In December 2011, Costa Rican President Chinchilla visited Japan and held business forum in Tokyo. JEPA Board attended the forum where many people from huge firm and investment companies including JETRO presented. President Chinchilla talked with Chairman Shimoji about the possibility of business between both countries.